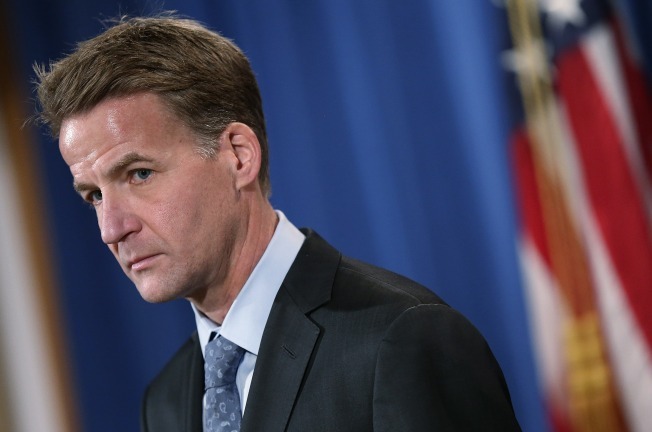 Acceding to the demands of the Trump administration, Zachary Fardon stepped down Monday as U.S. Attorney for the Northern District of Illinois. Phil Rogers reports. Attorney John Lausch has been selected as the next U.S. attorney for Chicago, the White House announced Thursday. Lausch is President Donald Trump's pick for the role, though he must still be confirmed. Lausch, a 46-year-old Joliet native and Harvard graduate, was an assistant U.S. attorney in Chicago for more than 11 years, serving as supervisor in the office from 2005-2010. He is currently a partner at Kirkland & Ellis LLP in Chicago. "I want to congratulate John Lausch on his appointment as U.S. Attorney for the Northern District of Illinois," Mayor Rahm Emanuel said in a statement. "John brings a strong public safety background to the office, and it is my hope that he will use the power of that office to increase the federal prosecution of gun crimes in Chicago and strengthen public safety in our communities." The nomination follows the resignation of former U.S. attorney Zachary Fardon, who ended his four-year term early due to a demand from President Donald Trump's administration. That demand asked that all 46 attorneys appointed by former president Barack Obama submit their resignations. Lausch was also a finalist before Fardon was selected. The task of filling the jobs of all three ousted Illinois U.S. Attorneys falls to downstate congressman John Shimkus, the senior Republican member of the state’s congressional delegation. Shimkus spokesman Jordan Haverly said earlier this year the office was in the process of collecting information and the names of interested parties. Shimkus planned on getting input from Gov. Bruce Rauner and even the state's two Democratic U.S. Senators, Haverly said. “We expect a very collaborative process,” he said. Stepping in to head the Chicago office on an interim basis is veteran prosecutor Joel Levin, who had been serving as First Assistant U.S. Attorney. A graduate of Yale University and Harvard Law School, Levin joined the Chicago U.S. Attorney’s office in 1997, after stints in Milwaukee and San Francisco, where he served as chief of the criminal division.